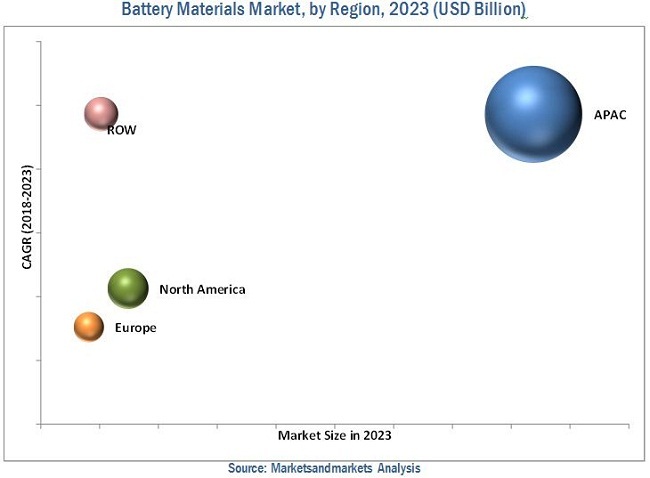 [170 Pages Report] battery materials market was valued at USD 39.64 Billion in 2017 and is projected to reach USD 65.78 Billion by 2023, at a CAGR of 8.62% during the forecast period. The base year considered for the study is 2017 and the forecast period is from 2018 to 2023. Both, top-down and bottom-up approaches were used to estimate and validate the size of the battery materials market, and to estimate the size of various other dependent submarkets. The research study involved extensive use of secondary sources, directories, and databases, such as Hoovers, Bloomberg, Chemical Weekly, Factiva, ICIS, and Securities and Exchange Commission (SEC), among other government and private websites, to identify and collect information useful for a technical, market-oriented, and commercial study of the battery materials market. The battery materials market has a diversified and established ecosystem of upstream players, such as raw material suppliers and downstream stakeholders, such as manufacturers, vendors, end users, and government organizations. Key players operational in the market include Umicore (Belgium), Asahi Kasei (Japan), Mitsubishi Chemical Holdings (Japan), POSCO (South Korea), Johnson Matthey (UK), Hitachi Chemical Company (Japan), Kureha Corporation (Japan), Sumitomo Corporation (Japan), Toray Industries (Japan), and Mitsui Mining & Smelting (Japan), among others. The global battery materials market for rechargeable batteries has been covered in detail in this report. Current market demand and forecasts have also been included to provide a comprehensive market scenario. The market has been further studied for key countries in each of these regions. The increasing demand for battery materials in various battery types is driving the growth of the battery materials market. In terms of value, the global battery materials market is estimated to be USD 43.50 Billion in 2018 and is projected to reach USD 65.78 Billion by 2023, at a CAGR of 8.62% between 2018 and 2023. The global battery materials market is driven by the increase in demand for EVs and various consumer electronics. Based on material, the lead-acid segment is estimated to account for the largest share of the battery materials market in 2018. Major drivers for the lead-acid segment include its use as an SLI battery in passenger cars, commercial vehicles, and in the motorcycle industry, along with its growing application in industrial energy storage systems. The electric vehicle subsegment is expected to be the largest lithium-ion application segment during the forecast period. The use of clean and sustainable fuel in the automotive industry and concerns among economists and environmentalists have led to the adoption of EVs. This will drive the battery materials market during the forecast period. APAC accounts for a major share of the overall battery materials market. 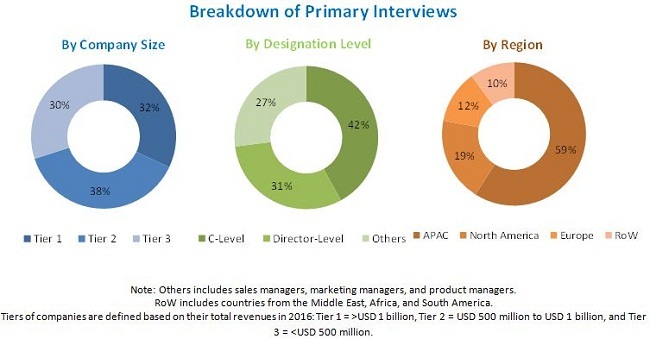 Major factors driving the growth of the APAC battery materials market include the high demand for battery energy systems in APAC countries, along with several battery consumers (automobile, portable device, and industrial) entering the global market with a larger presence in the APAC countries. The drivers for the market growth in the APAC countries include the shifting preference from fuel energy to battery energy due to regulations on CO2 emissions and government support through policy changes and subsidies. This has further increased the demand for electrified vehicles including battery electric vehicles (BEV), plug-in hybrid vehicles (PHEV), and hybrid electric vehicles (HEV). However, stringent safety requirements for batteries during operation are expected to restrain the growth of the battery materials market during the forecast period. Key manufacturers of battery materials include Umicore (Belgium), Asahi Kasei (Japan), Mitsubishi Chemical Holdings (Japan), POSCO (South Korea), Johnson Matthey (UK), Hitachi Chemical Company (Japan), Kureha Corporation (Japan), Sumitomo Corporation (Japan), Toray Industries (Japan), and Mitsui Mining & Smelting (Japan), among others.